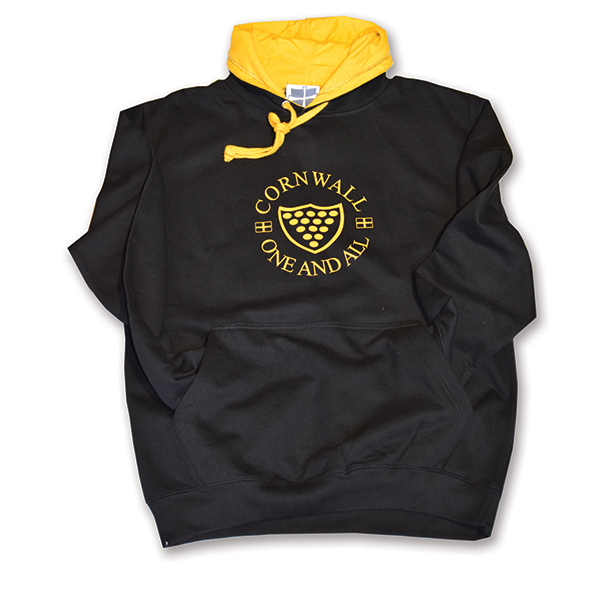 Our Cornwall One and All Hoodie is warm and comfortable and epitomises relaxed Cornish style! Brushed back fleece fabric in classic Cornish black with contrasting Cornish gold printed logo, ties and hood lining. Kangaroo pockets to put those useful bits and pieces in or just to keep your hands warm! Legend has it that the Duke of Cornwall was captured by the Saracens during the Crusades. A ransom of fifteen golden Bezants was demanded. All the people of Cornwall raised the sum and the Duke was set free. Hence the Cornish motto “One And All”.